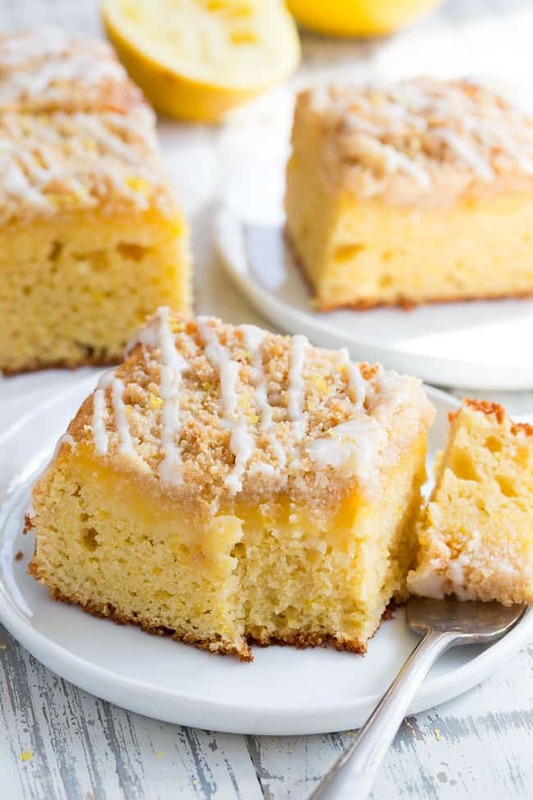 This amazing paleo lemon crumb cake is deliciously sweet/tart and bursting with fresh lemon flavor! 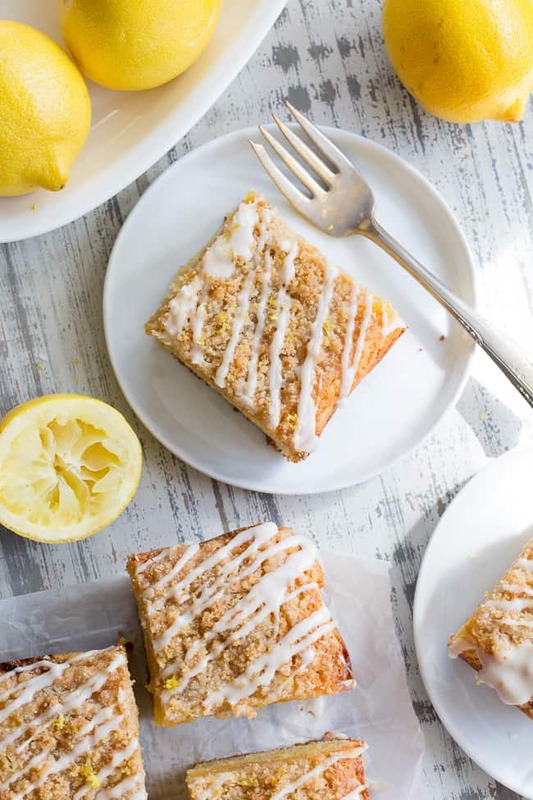 It starts with a perfectly moist lemon cake layer, topped with lemon curd, piled with crumb topping and drizzled with lemon glaze. It’s gluten-free, dairy-free, paleo will become a favorite dessert with the first bite! This has been a MUCH anticipated recipe since I made it, um, 4 days ago. I surprised myself with just how incredible it turned out, even though I had pretty high hopes in the first place. I posted my results on Instagram stories, and I immediately received tons of requests to get the recipe up ASAP! 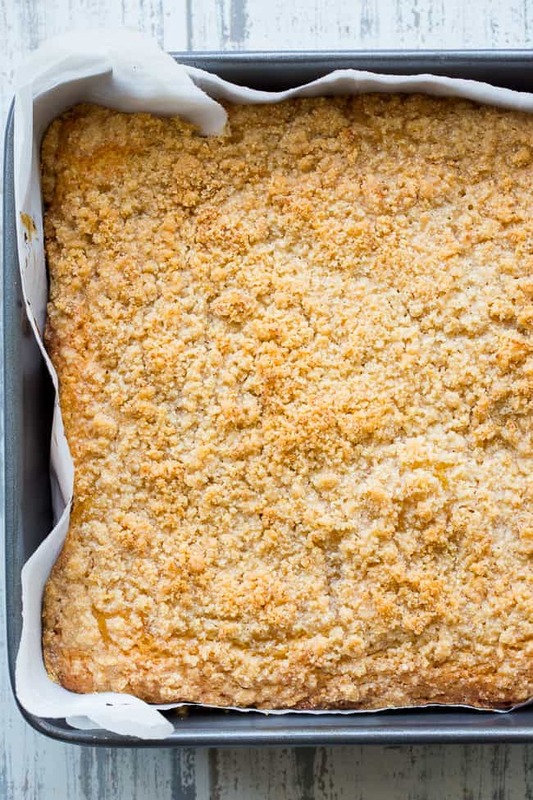 So, here we are – with an absolutely perfect paleo lemon crumb cake (with a creamy layer of lemon curd!) on a Sunday – just in time for brunch! You’ll notice that I didn’t write out the recipe for the lemon curd, but linked to it – since I used the exact same lemon curd recipe that I used for my lemon curd tartlets. Back to the cake though. 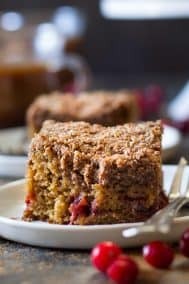 The cake recipe is similar to the recipe I used for my cranberry orange coffee cake and orange poppy seed muffins. Lots of citrus, some coconut oil, and maple sugar to sweeten to keep the color light and lemony. If you prefer, you can use coconut sugar, however, the color of the cake will be significantly darker! I also used maple sugar for the topping, so the same rule will go for that, too. As long as you use a granulated sweetener (and not honey or maple, which would impact the liquid/dry ratio) the cake will be just fine. You can see how I layered the lemon curd over the unbaked batter in the above photos, then covered with lots of crumb topping to bake. 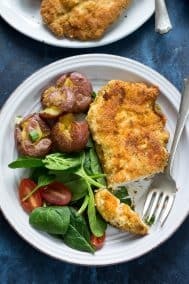 It will probably seem like you have a ton of crumb topping, but it will all bake together well and make for tons of flavor and texture in each bite. I decided to give you options for the icing/glaze, since there are SO many ways to create a white icing, but everyone has their own preferences about what ingredients they use/have on hand. The simplest icing (and what is shown in the photos) is organic powdered sugar mixed with lemon juice. While not technically paleo if you use organic powdered sugar, you can also make your own powdered sugar by putting your maple sugar in a food processor until fine like powder, then mixing that with your fresh lemon juice. I also tested a honey-sweetened icing – super simple – using raw honey, lemon juice, and tapioca flour. The consistency completely mimicked the traditional icing, however when tasting it, I noticed more of a “powder” in the texture. However, once on the cake, this is something I doubt you’d notice at all. And because I might be crazy, I’ll give you 2 more icing options! If you’re a coconut butter fan, you can’t go wrong with gently melted coconut butter with a bit of honey or maple syrup mixed in. You can also add lemon juice (room temp) to this mixture, although it occasionally becomes a problem for the texture of the coconut butter, making it clumpy instead of smooth. Lastly, I made a great glaze for my cinnamon rolls that is essentially sweetened condensed coconut milk. It’s more work (since you have to cook it!) but once it cools it’s perfect for drizzling and would work well on this cake. 1.) You MUST make this cake! There are many steps involved and yes, it’s more work than other crumb cakes, BUT, it’s easy (promise) and the results are well worth it. 2.) You can make the lemon curd right before preparing the cake, OR up to a day ahead of time. 3.) 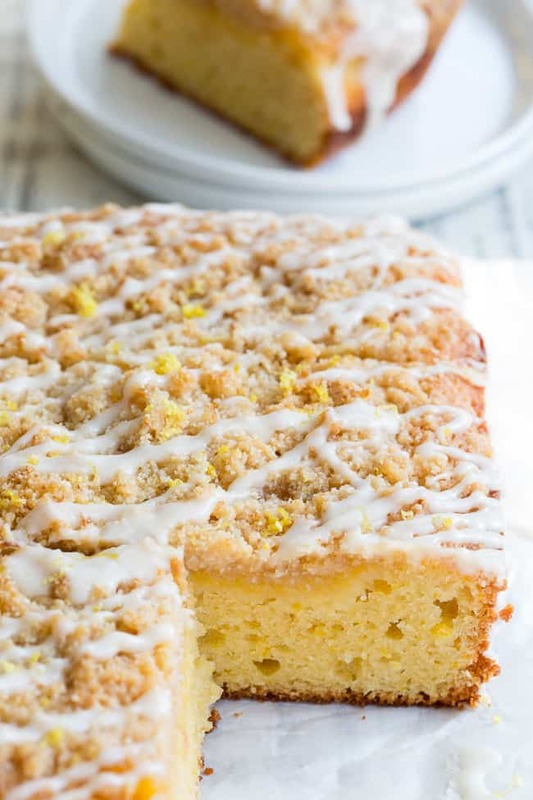 The cake has 3 layers which all bake at the same time – cake batter, lemon curd, and crumb topping. 4.) Fresh lemon juice is a must for this recipe (and all lemon recipes, in my opinion!) Again, it’s a bit more work, but WELL worth it. 5.) This recipe will be LOVED by everyone in your house, and anyone you serve it to. I don’t care how picky they are – seriously – my 6 year old WHO EATS NOTHING NOT EVEN CHOCOLATE CHIP COOKIES really enjoyed this cake! So there, I think I’ve gotten my point across. Let’s get our aprons on and ovens preheated, oh and start squeezing those lemons – let’s go! 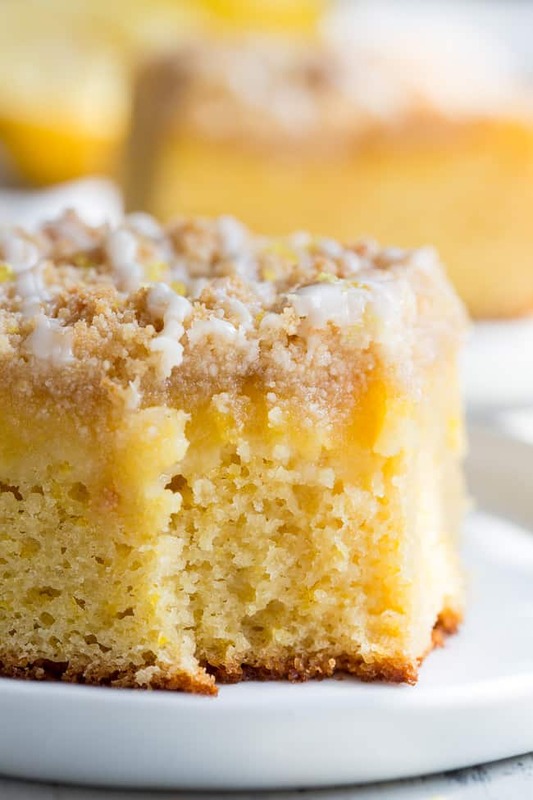 This amazing paleo lemon crumb cake is deliciously sweet/tart and bursting with fresh lemon flavor! 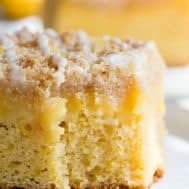 It starts with a perfectly moist lemon cake layer, topped with lemon curd, piled with crumb topping and drizzled with lemon glaze. It's gluten-free, dairy-free, paleo will become a favorite dessert with the first bite! 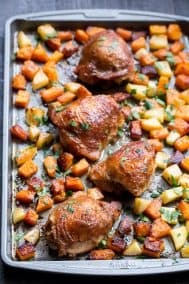 Preheat your oven to 350 degrees and line an 8 x 8” square baking pan with parchment paper on the bottom and sides, for easy removal. 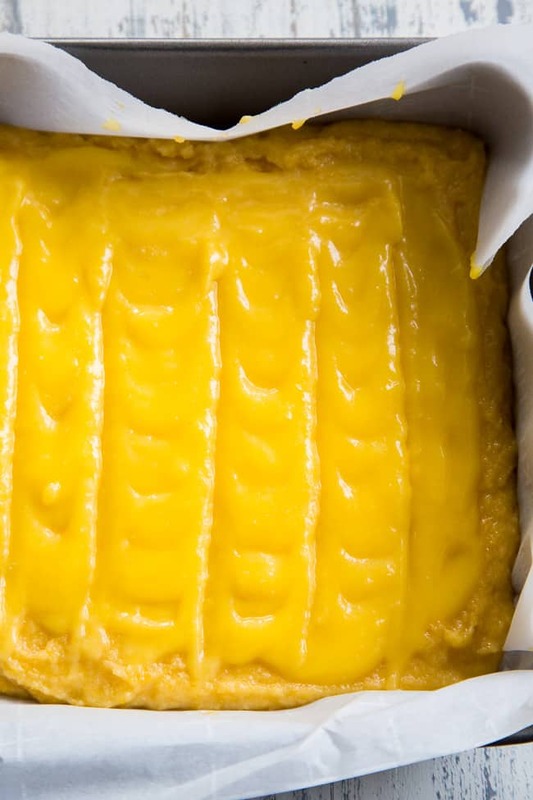 Prepare the lemon curd, then set aside to cool to room temp while you prepare the cake. Lemon curd can also be made ahead of time, if preferred. 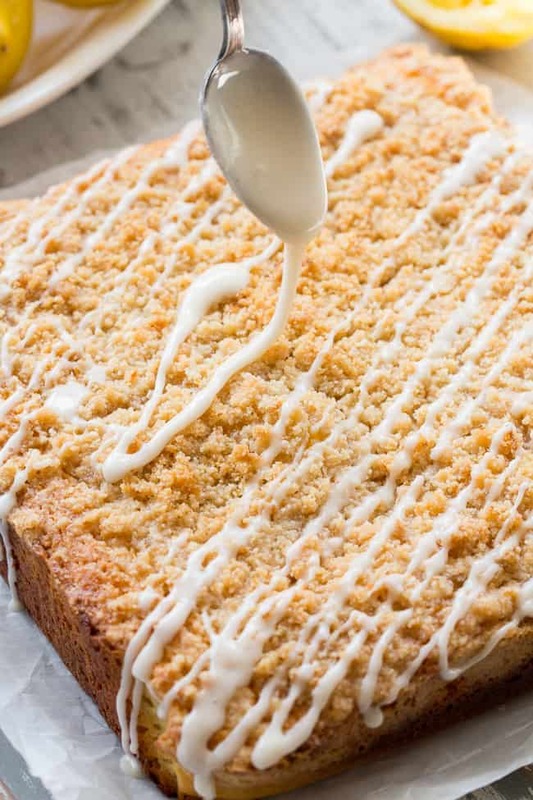 Next, make the crumb topping by blending all ingredients with a fork or pastry blender until a texture is crumbly, chill in the fridge while you prepare the cake batter. In a large bowl, whisk together the eggs, lemon juice and zest, coconut oil, vanilla and almond extract, and sugar. In a separate bowl, combine the almond flour, tapioca flour, baking soda and salt. Stir the dry mixture into the wet until well combined and smooth. Using a silicone spatula, transfer cake batter into the parchment lined cake pan and smooth out evenly. Using a Tbsp, dollop the lemon curd over the cake batter, leaving 1/2” around the perimeter, then gently swirl with cake batter. Sprinkle crumb topping all over the top to cover completely, then bake in the preheated oven for 35-40 mins until cake is set in the center. Cool completely on a wire rack before slicing and serving. For toppings, you can dust with organic powdered sugar (not paleo), drizzle on icing and garnish with grated lemon zest. While cooling, prepare the icing/glaze of choice. 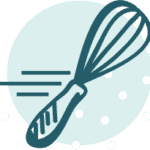 Whisk together ingredients until you get a consistency that you can drizzle (if making your own powdered sugar, do this ahead of time) then use a spoon to drizzle icing over the cake as desired. Enjoy! *The glaze for my cinnamon rolls would also work well - find the recipe here. **Find my easy recipe for lemon curd here. 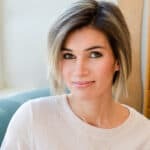 ***You can make your own powdered sugar with maple sugar by blending it in a food processor until powdery, and using it in place of organic powdered sugar. Note, the color will be darker. Sounds like the perfect Mother’s Day dessert 🙂 This is a good one to test drive! I’m with Ilene’s mom, I love everything lemon and this is your second one in a row! 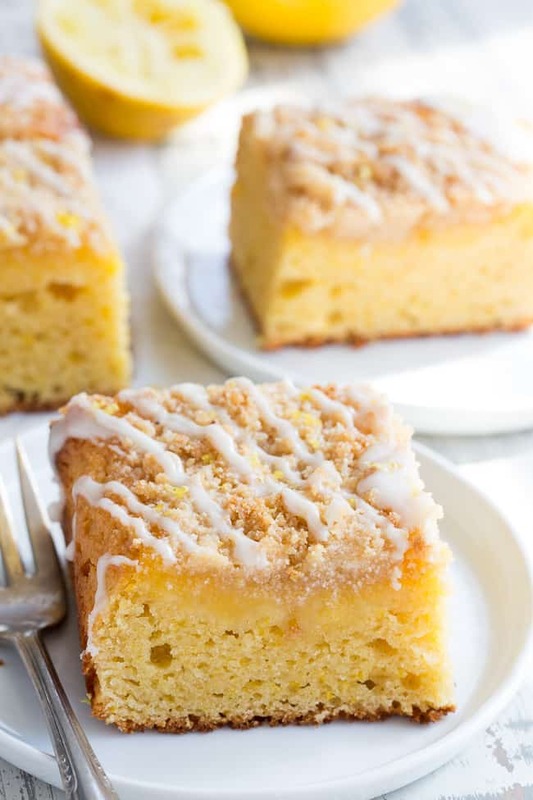 I don’t know which way to go first, lemon squares or this delicious looking lemon cake. Hmmm, cake, squares – squares, cake, decisions, decisions! I think you’ll really love this one! Hi. This looks so wonderful!! But I had a baking question: is there a difference between almond flour and ground almond meal? 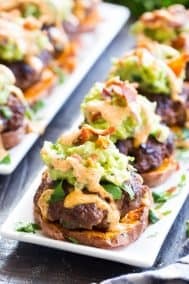 I have made several paleo breads/muffins recipes with no problem. My Trader Joe’s stopped carrying their almond flour and had, instead just the almond meal. So I used that and baked your apple crumb top muffins and they were not good. The texture was weird. Ended up throwing the whole batch in the trash. ? I am just wondering if that was it?? If the almond meal was the culprit. Thank you in advance for your thoughts and advice on that. I want to continue baking, but not if I end up trashing them!! ? Supposedly they’re the same thing, but from experience the almond flour is ground much finer and produces a better texture than almond meal. I tried switching them and the almond meal makes for a grainy texture in baking. I’m sticking with almond flour for my backing. Hope this helps. Anyone else have a problem with their cake batter being way too dry? I have gone over the recipe a ton cant figure out what I missed. Did the cake itself come out dry? 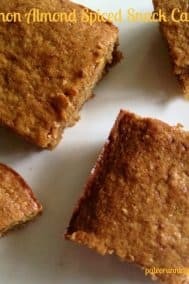 Often my cake batters are thick due to the paleo flours being different from traditional. The other thing I can think of is the type of almond flour, I used a fine blanched almond flour (linked to it) so, although almond flour is usually forgiving, using a different brand might affect the consistency of the batter. Oh man I’m so sorry, I just when back to try again and realized I grabbed the coconut flour and not the almond. Thanks for taking the time to reply- I’ll try again. I’m sure Michele could give a more technical answer but my experience is that almond flour is ground very fine; almond meal is ground but is coarser. That could be the texture problem but if you try it again, I’d put the almond meal in a high speed blender (or at least a food processor) and grind it more so that it is very fine like the flour. Any suggestions for replacing the eggs in this great-sounding recipe? 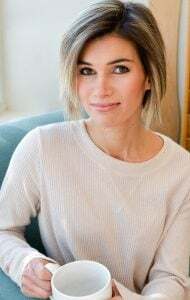 You can try flaxseed eggs – I typically mix 1 Tbsp ground flax with 2.5 Tbsp water and let it sit for 15 mins for 1 “egg”. Not sure if it will work since it hasn’t been tested though. Omg this looks SO GOOD and springy! I can’t wait to make it! And a huge yes to fresh lemon juice. The bottled stuff is just not the same. I knew I had to make it as soon as she posted the recipe. I made it today and it did not disappoint! I only had coconut sugar so it did turn out darker like Michele mentioned it would. I can’t imagine it lasting very long in our house! I used the leftover lemon curd on top of paleo cookies and it was also amazing. I love everything lemon and I could seriously eat the lemon curd with a spoon! Hi Michelle. My husband will not eat lemon anything. I was wondering if I could make this with oranges? The recipe sounds so good! Is there supposed to be baking powder? Mine is extremely flat. Like half the height of yours. Any ideas? The lemon curd is amazing though. I could just eat that with a spoon. Nope no baking powder, not sure! I made this this recipe today. This cake is delicious! Made this for a brunch today along with your chocolate chip donuts and cinnamon rolls. It was a huge crowd pleaser and absolutely delicious!! Oh wow thrilled to hear that! This is THE absolute best!!! Thankyou for sharing. I had to use coconut sugar so the cake was darker but still amazing. I also doubled the lemon curd topping because, well I tasted it and I couldn’t help myself :-). 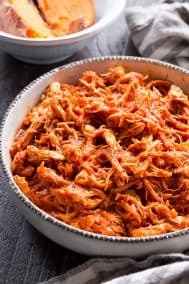 My absolutely favourite recipe by far!!! That’s incredible to hear, thrilled you liked it! Mine baked high on the sides and sunk in the middle – while I’m sure it will still taste good, it doesn’t look as pretty as yours – any idea what I could do differently next time? PS: the lemon curd is to die for! Yummy! Not sure what happened, maybe the baking dish? I used an 8×8 metal baking dish lined with parchment paper. Also, did it rise and then fall after removing from the oven or never rise at all? It might have needed a few more minutes in the oven. I used an 8×8 metal dish as well, and lined with parchment. It did not rise in the middle at all, only on the perimeters (which were getting quite brown, so I didn’t want to leave it in longer). I will give it a try again sometime and decrease the temp of my oven by 5 or 10 degrees – it might be that my oven is too hot! I doubled this and made it for my in-laws’s 68th wedding anniversary. Everyone loved it so much!! My only complaint was that there was barely any leftovers the next day. Literally one and a half little pieces. Can’t wait to make this again. And again!!! Oh that’s awesome, thrilled it worked out! I made this and it tasted sooooo amazing thank you for this recipe! Oh my gooooodnesss! This is so yummy. I usually don’t take the time to write comments on these but I couldn’t help it. I made with white coconut sugar. Heaven. I’ve needed a lemon bar type recipe for a while. Thank you! Is there a vegan option for the curd? I would love to reduce the amount of eggs used. Is there any substitute for tapioca flour? Hi, made this today, mine also fell in the middle, Do you mix. The curd alot with batter, maybe mine wasn’t mixed in well ?.. …. I didn’t mix my curd into the batter at all, just layered it on top and slightly swirled but it’s mostly a layer above. I’ll clarify that in the recipe. Ok thanks will try again, was really delicious,anyway. Family loved it! 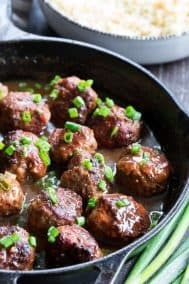 could i make this with unrefined coconut oil ? i have a huge tube and i rather not buy another coconut oil refined? Mine wasn’t as pretty as the pictures, (but I have zero baking skills). Nobody cared what it looked like because it turned out delicious!! This has been my go-to recipe all summer long. Delicious! And a real crowd pleaser. One of my favorites as well, thrilled you’re enjoying it! Love you recipes! But, I always seem to have a problem with crumble toppings in paleo recipes. They don’t seem to crumble. When making this cake the topping was very sticky and almost didn’t cover the whole cake. Any suggestions. Chilling it in the freezer and crumbling it from there usually helps if mine gets melty! This is amazing! 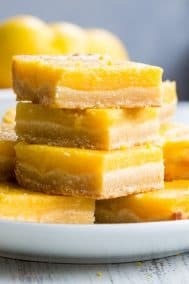 My daughter and I made it this morning but subbed 1/2 c of the sugar in the cake batter with applesauce and used a lower sugar lemon curd- it tasted a little more lemon bar-ey than if we’d used all the sugar probably but it was perfect! For the icing we used cream cheese, lemon juice and 1/3 c powdered sugar and it went really well with the rest of the cake! Can you substitute the sugar with honey? I have a jar of commercially made lemon curd in the fridge, can I use it in this recipe or will it be too thick? I can’t wait to try baking this! Such great layers! Hello, this sounds delicious . If I used regular flour do you think it would change the cake mix a lot? Have you tried regular flour ? Thanks ! This recipe is something special! I made two of the cakes without the crumb topping so I could layer them for a birthday cake. The lemon curd (holy smokes – it’s amazing) was in between layers. I put some strawberries & blackberries on top with a bit of the powdered sugar and lemon juice glaze. When mixing, I separated my eggs and whipped the whites separately. I folded them in at the end which gave this cake s light texture. Everyone loved it – especially the birthday girl!